Toby Maclaurin at Ocean Independence asks me to broadcast news of a further €845,000 price cut on the 32m motor yacht Aslec 3. Designed by Tommaso Spadolini, Aslec 3 was built in cold moulded mahogany by Italy’s Castagnola yard in 2007 to RINA class. 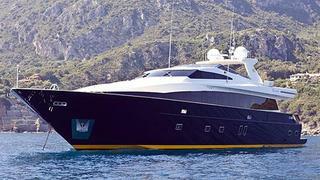 Her interior, by Celeste dell’Anna, is very contemporary and accommodates 12 guests in a main deck master suite with two double and two twin cabins below. Her twin 2300hp Deutz engines have only 470 hours on them. Lying in Mari di Cala Galeria, Italy, the price of Aslec 3 is now down from €3,245,000 to €2,400,000.